Santastic Video Slot Guide & Review - Casino Answers! Santastic is a 5-reel, 15-line video slot developed by Random Logic, featuring a wild symbol, a free spins feature and a bonus game. You can play the Santastic video slot at Bovada. Bets on the Santastic slot machine are $0.05, $0.10, $0.25, $0.50, $1, $2, $5 and $10 per line. You can select from 1-15 paylines on a spin on Santastic. The lowest total bet you can make is a nickel per spin up to the highest total bet of $150 per spin. Santastic has a large betting range that will suit any casual player or high roller. There is an autoplay mode where you can play up to 99 autoplay spins at a time. To play Santastic, select your bet and hit the “Spin” button or hit the “Bet Max” button to play all 15 lines. The highest paying symbol on the Santastic online slot game is the Present symbol. If you 5 Present symbols land on a payline on Santastic, you can win the 4000 coin top jackpot. The second highest paying symbol is the Christmas Tree symbol, which can pay up to 1000 coins. The wild symbol on the Santastic X-Mas slot is the Rudolph symbol. It will substitute for all symbols in Santastic except for the scatter and bonus symbols. The Rudolph wild symbol does not pay out by itself. If 3, 4 or 5 Scattered Snowman Globe symbols appear anywhere on the reels of Santastic, you will win 10, 30 or 50 free spins. Free spins will play the same number of active paylines and bet per line as the original game. All prizes, including additional free spins (which will be accumulated to the existing free spins infinitely), can be won during the free spins feature. Just imagine what a Santastic Christmas you could have if you were able to hit 50 free spins from the Santastic free spins feature at Bovada! All symbols pay left to right on consecutive reels of an active payline, except for scatter symbols. All wins are multiplied by the bet per line. Scatter and bonus wins are paid in addition to payline wins. Only the highest win is paid on each of the active paylines. Santastic is a fantastic Christmas slot that can get anyone into the Christmas spirit. You can get to the bonus game without much trouble and when you get there, you will have the chance to win enough cash to have a very Merry Christmas. You can play the Santastic video slot by signing up and making a deposit at Bovada. 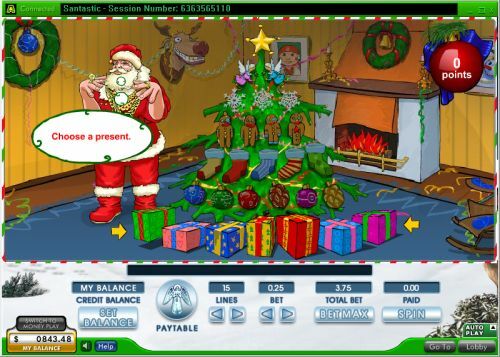 Can players from the United States of America play the Santastic X-Mas slot game? Players from the USA cannot play the Santastic video slot for real money at this time. For a great selection of X-Mas slots that USA players can play, we recommend you visit Bovada. What is the scatter symbol on the Santastic video slot? 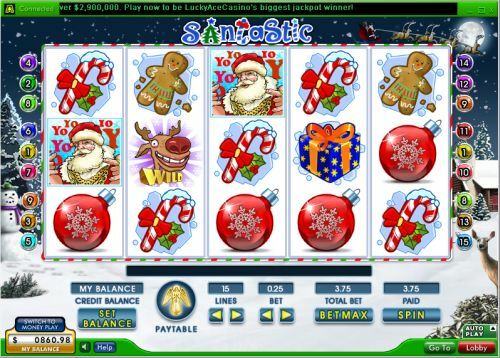 The scatter symbol on the Santastic online slot game is the Snowman Globe symbol. It is only used to trigger the free spins feature and does not pay out by itself. 3, 4 or 5 scatter symbols will win you 10, 30 or 50 free spins in the Santastic free spins feature.